Need something quick and easy? 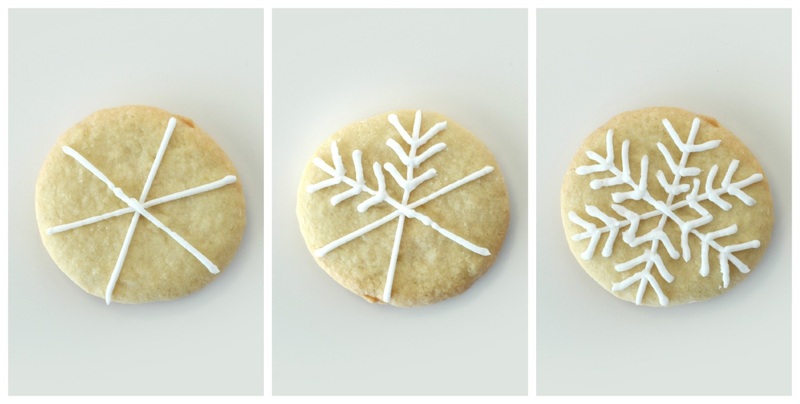 These snowflake Christmas cookies are just what you need! They are dainty and adorable, but only require a semi-steady hand! 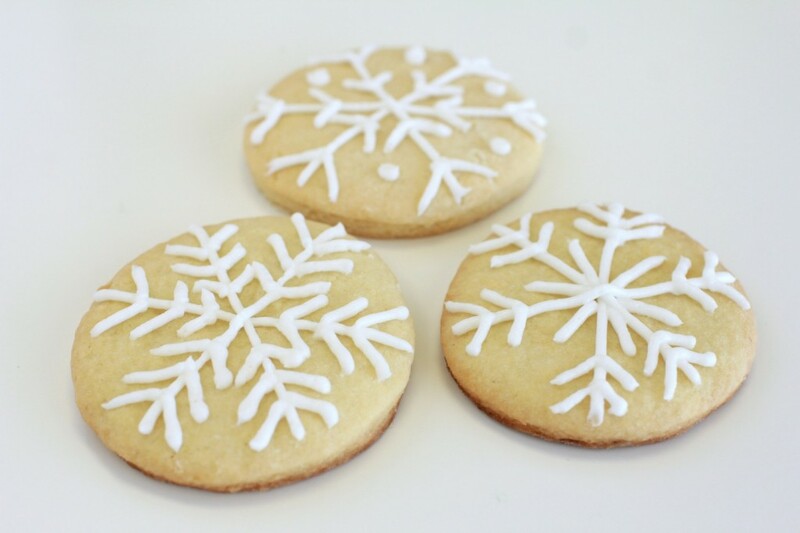 See my favorite sugar cookie recipe below. 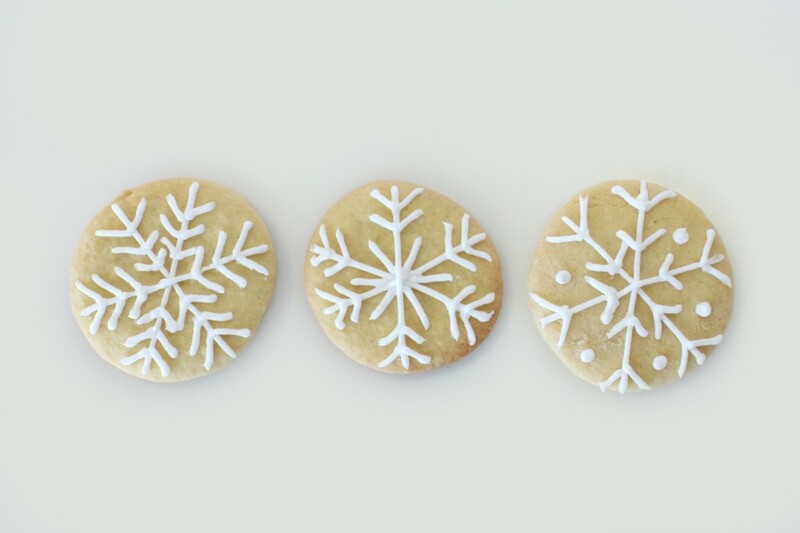 These cookies are only about 3 inches in diameter, but you could easily make them any size. Also, no need to color any frosting, a simple white frosting is perfect. 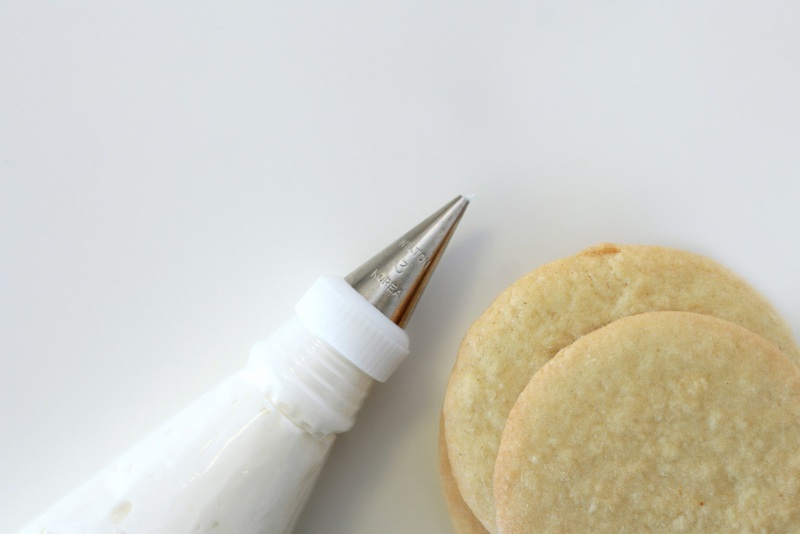 All you need is a piping bag and a small circle tip. I used Wilton’s #3. Tip: Keep it simple and use a circle cookie cutter. Don’t have one handy? Use a glass! Start by making three lines that criss-cross to get 6 sections or points. I was told there is statistical evidence that snowflakes always have six sides, so I made sure to only have that many on the cookies. Don’t forget, all snowflakes are different, so be creative! These adorable Christmas cookies are sure to impress your family and friends. Too easy? Try our Snow Globe Cookies and Poinsettia Cookies next! Yield – Makes about 30-35 cookies, but it will also depend on the size of the cookie cutter and how thick you make your cookies. 1. Cream the butter and sugar together in the bowl of an electric mixer on low to medium speed. (Use the paddle attachment). Mix until thoroughly incorporated – for about one minute. Scrape down the sides of the bowl with a plastic spatula and mix again for a few seconds more. Over-mixing the butter and sugar in this step will cause too much air to be incorporated into the dough. If you’d like a light and fluffy cookie, that’s ideal, however the dough will spread more during baking; not ideal if you’d like the cookie to hold its shape. 5. Add all of the flour mixture to the bowl. Place a large tea towel or two small tea towels between the edge of the bowl and the electric mixer so that the flour won’t escape. Mix on low speed for 30 seconds. Remove the tea towels and observe the dough mixing; when it clumps around the paddle attachment it’s ready. It’s also important at this stage not to over mix the dough (the glutens in the flour develop and the dough can become tough). 1. Cream shortening until fluffy. Add confectioner’s sugar and continue creaming until well blended. 2. Add salt, vanilla, and milk; blend on low speed until moistened. Add additional milk if necessary (up to 2 tablespoons). Beat until frosting is fluffy. Hi there, yes butter works just fine. Enjoy them! How do you print the recipe from your site?